Given a digraph G, we propose a new method to find the recurrence equation for the number of vertices n_k of the k-iterated line digraph L_k(G), for k>= 0, where L_0(G) = G. We obtain this result by using the minimal polynomial of a quotient digraph pi(G) of G. We show some examples of this method applied to the so-called cyclic Kautz, the unicyclic, and the acyclic digraphs. In the first case, our method gives the enumeration of the ternary length-2 squarefree words of any length. 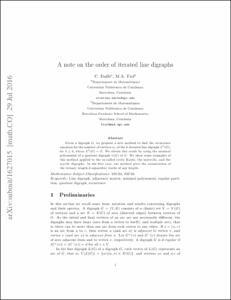 Dalfo, C., Fiol, M. A note on the order of iterated line digraphs. "Journal of graph theory", 2017, vol. 85, núm. 2, p. 395-399.